Extract Technology Ltd. (ETL) is a leading containment and aseptic systems manufacturer supplying customized containment solutions to a global network of pharmaceutical and chemical manufacturers. ETL often relies upon the expertise of other suppliers for specific technology requirements. When a global pharmaceutical manufacturer sought two high-containment downflow booths with integrated sieving solutions, the company combined its expertise with Russell Finex – global leader in pharmaceutical sieving and filtration equipment. ETL’s range of downflow booths provide aseptic, contained environments for the safe handling of pharmaceutical powders. The customer on this occasion requested a complete solution for unloading, transferring and screening active pharmaceutical ingredients. The sieving unit needed to be compact, to allow easy integration into a containment environment, as well as quick and easy to dismantle and clean. Furthermore, the solution required the capacity to sieve fine pharmaceutical powders such as folic acid or silicon dioxide at high throughputs. Following consultation with Russell Finex, ETL’s solution was two downflow containment booths with integrated Russell Compact Sieve® units and Vibrasonic® Deblinding System. 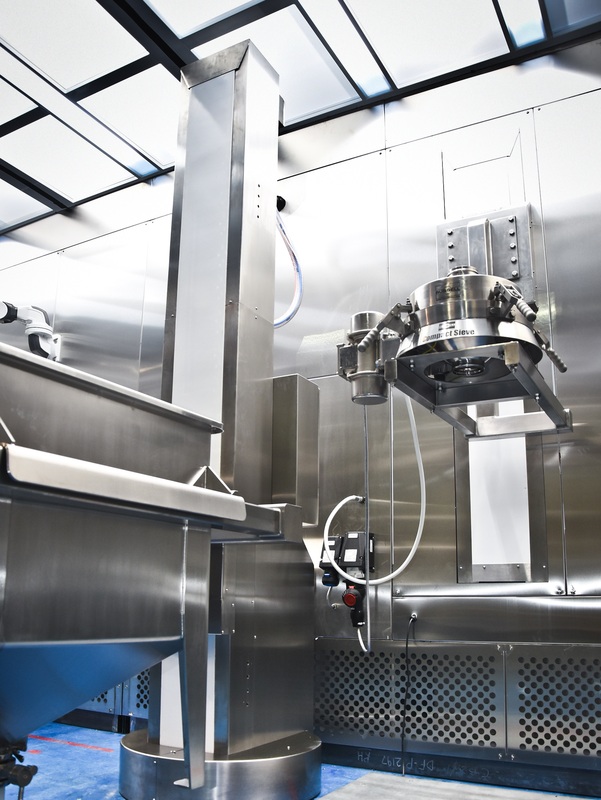 The sieve units are installed at the end of the downflow booth process, loaded by an elevated hopper following the contained dispensing and weighing of pharmaceutical powders. The Russell Compact Sieve® was the ideal solution for this type of installation. These vibratory pharmaceutical screeners are used to guarantee the quality of powders during production, providing accurate, high-capacity screening at less than half the size of traditional screeners. The units are quick and easy to dismantle and clean, ideal for the aseptic requirements of pharmaceutical powder processing. The addition of ultrasonic sieving technology eliminates mesh blockages, allowing good product to flow freely through the mesh. Contact us to learn more about how the Russell Compact Sieve® and Vibrasonic® Deblinding System can help you to improve your product quality.